With many audio systems consisting of separate units, you’ll often ﬁnd that due to economic reasons only the amplifier has a remote control receiver module. The control signals are then sent to the other units using patch cables. The tuner and CD player, for example, won’t have a built-in receiver module. When the tuner from such a system is bought separately it can therefore not be used directly with a remote control, which is a big disadvantage in practice. The only way in which this can be accomplished is to connect an IR receiver to the input used by the patch cable. And that is exactly what this circuit is for. In practice it is not always clear which signal should be used and what its polarity should be. However, it will most likely be a demodulated signal. For these reasons we’ve combined a standard IR receiver module and two inverters. The first inverter also functions as a buffer, since the output of the module has a high impedance. The output of the receiver module is active low, so the ﬁrst inverter outputs a non-inverting signal. The second inverter inverts this signal again. 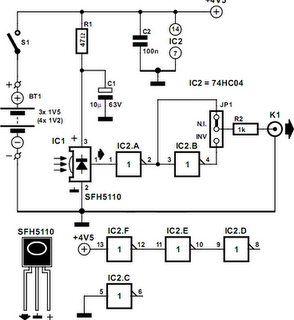 Jumper JP1 is used to select which of the signals is presented at the output. R2 protects the output from short circuits or possible over-loading of the electronics in the equipment it’s driving (for example when the input circuit uses 3 V logic). R1/C1 suppress any possible supply spikes. Batteries are suitable for the power supply, because the circuit only takes about 1 mA. With a set of four rechargeable batteries with a capacity of 1800 mAh the circuit can function continuously for 2.5 months. Four NiMH cells and a charger are therefore perfect for the power supply. If you can be sure that the circuit will always be switched off when not in use, you could also use three ordinary alkaline batteries (AA cells). Because of their slightly larger capacity they will probably last for about half a year. When making your choice you should of course keep in mind that rechargeables are better for the environment.